Prevent seed from falling to the ground from your existing tube feeder using the Droll Yankees Omni Seed Tray. This lasting platform not only catches seed spilled from feeder ports; it also creates perching area for larger birds. 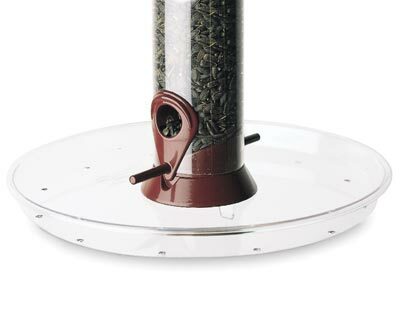 Its generous, 10.5" diameter offers plenty of dining and perching spots, inviting cardinals and doves to use the feeder. The included, threaded rubber plug secures this tray to your existing Droll Yankees Classic, Onyx, New Generation, Ring Pull, or Bird Lovers tube feeder (not included) in moments. Made of UV stabilized polycarbonate, this item will remain durable without yellowing for several seasons. Help more birds feed while keeping your yard tidy with this Omni Seed Tray. Made in the USA. Note: This description refers only to the Droll Yankees Omni Seed Tray. A feeder is not included. Droll Yankees A-6 Seed Tray, 7.5" dia.